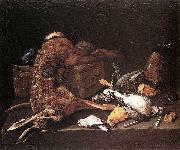 (1634 - 29 May 1695) was a still life Italian painter. Born in Naples, he likely apprenticed with his family, including his father Giacomo Recco and uncle Giovan Battista Recco. His children both son Nicolo and daughter Elena were also painters. A large part of his output was painted in Spain, where his assemblies of victuals, both vegetable and animal, were popular. It is claimed he was influenced by the neapolitan Giovanni Battista Ruoppolo. Recco died at Alicante, Spain.